Trade Shows: There are always plenty of these going on, ranging from the smaller, local affairs to events with an international outreach. Have a look around to find one that is relevant to you and book yourself a booth. Trade shows are an excellent way to both make new business contacts and launch any new products or services you may have. But to make the most of this marketing opportunity you will need your booth to stand out: make sure you invest in plenty of good-quality display boards and exhibition stands. Spend time designing posters, flyers and so on that will create a buzz and make people want to come and find out more about your company. Local Events: If you want to reach out to customers in your local area then why not consider holding a one-off event? This could take the form of an open-day or maybe some kind of sponsored charity event. It will give you the chance to meet people and spread awareness of who you are and what you do. If you don’t have the resources to put into organising your own event you could always look into sponsoring a local event instead. Find out what’s going on in your area. 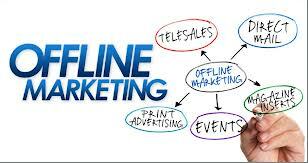 Advertise: It’s as old as the hills, but advertising is one of the most tried-and-tested offline marketing methods. No company can do without it entirely. If your marketing budget is limited then don’t worry: you don’t have to spend huge amounts on an advertising campaign. Consider taking out an ad in your local paper or trade magazine, or putting up posters around the town. Or you could consider making an ad for your local radio station. Not everyone can afford to take out huge billboards or advertise on TV. Word Of Mouth: If you can get some good word of mouth recommendations then you will surprised how quickly you can build a good name for yourself. But be warned: this can have both positive and negative connotations. You need to make sure that your products and services are always of the highest standard. Don’t be tempted to cheat people to make a quick killing as this will always come back to haunt you. Stationery And Branded Goods: Putting your company logo and website on goods such as pencils, pens, cups and mouse mats can be a very effective marketing tool. Also, remember to get some business cards made up: not only will these help you when networking, they will also act as a free advertising tool when people take them away. You never know who is going to come across your brand in this way. Flyers: For smaller, local companies, flyers are just as effective as they always have been. Yes, it’s an old-fashioned method of advertising products or special deals, but in some situations the oldest and simplest methods are the ones that work the best. If you have a special promotion then a flyer can be designed and printed out in bulk very cheaply indeed. Then all you have to do is get them distributed in your local area. You can either go down the route of having someone stand in town and hand them out to passers-by, or you can get them mailed. To avoid them coming across as ‘junk’ mail, talk to local newspaper leaflet distributors to see if you can get them placed in the papers and included in delivery rounds. In the Internet age, many businesses forget that offline marketing is still just as important as building their web presence. From attending trade fairs to local advertising and running one-off events, this article looks at some of the offline marketing methods available to you.